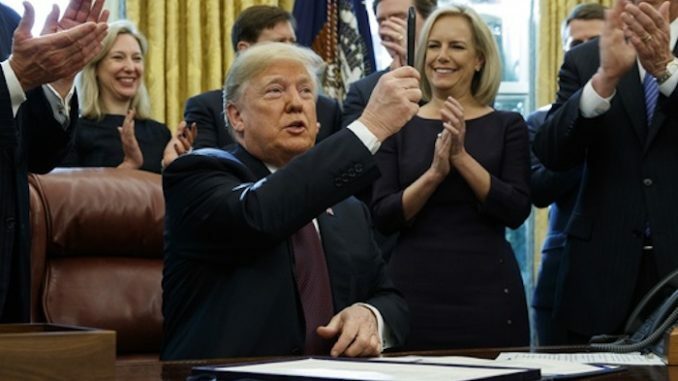 President Donald Trump is preparing to declare a State of Emergency in America, in order to build the US-Mexico wall without Congress’ approval. Breitbart.com reports: The president spoke to reporters in the Rose Garden on Friday at the White House after meeting with Congressional leaders for more than two hours to try to make a deal. Trump confirmed that he said that he was willing to keep the government shutdown for up to a year, if necessary if Democrats refused to make a deal on border security funding. Trump said that he was not pleased that the government remained shut down as Democrats refused to compromise with his demands, but would continue to stand strong on the issue. “I’m very proud of doing what I’m doing,” he said when asked if he was “proud” of the shutdown. Trump said that he was adamant about getting funding for the border. He also signaled interest in building a “steel wall” that you could see through, declaring that it was probably stronger than a concrete wall. Trump reminded reporters that he was present at the White House during Christmas and New Years looking to make a deal with Democrats, and received zero response. The president said he remained “very firm” on the $5.2 billion number requested for border security. “We have to get a structure built,” he said, adding that the federal government had already replaced existing fencing on the border. The partial government shutdown is now in its 14th day.